It seems that February somehow managed to slip away from me. One minute I was in the kitchen, making ice cream, broiling grapefruit and blanching endless amounts of greens from our CSA box (aphid season is upon us) for gratins, all while fantasizing about the many blog posts I would and should write about these delightful things. Then, the next thing I knew, the end of February was upon us and I was running through through the Phoenix airport with my luggage, dramatically yelling “waiiiiiiiiiiiiit” as I heard the last announcement for the 10:30 flight to JFK. The good news is that I made the flight, but just barely and, when I disembarked the next morning, exhausted and still wheezing from my unexpected 1+ mile dash from the night before, I encountered the kind of cold that I had known only in a previous lifetime–namely during my winter in St. Petersburg. Fortunately, my business there, the final academic conference of my career (unless, that is, I bite the bullet and attend one more just so the Greek and I can vacation in Japan; as appealing as that sounds, I sincerely doubt I will), kept me largely indoors, although I did brave the cold and walk 15 blocks for an Absolute Bagel. If I learned one thing during college, it was that an everything bagel with lox is the epitome of happiness. The whole trip felt like a whirlwind tour down memory lane, especially since I spent the bulk of my time at Columbia (my alma mater). So many things were recognizably the same–the scent of candied nuts that hits you when you exit the 116th and Broadway station, the hidden Italian restaurant where I celebrated my 22nd birthday with my family, the urban elegance of the campus–that I couldn’t help but experience waves of nostalgia. Never mind that the conference experience, save for the dinner the first night, felt like a dud; the thing that really mattered was that I had, in a sense, come full circle academically. Columbia was where I had embarked on my crazy Russian literature love affair and it also fittingly became the place where it all ended. I never planned it that way (how can such a thing be planned?) but, regardless, it speaks to my love of clean endings. Although I managed to squeeze all of my New York essentials (bagels, books, Broadway and brunch) into this trip, as well as to have a leisurely reunion with my college friends one blustery evening, it still felt too short. But my sense of loss aside, I suppose it’s best not to be greedy. I always feel that there’s a brief period of adjustment whenever I come back to California from New York–a moment when I realize that things have become both slow and quiet. The truth is that time simply moves differently here; Bay Area time is measured, perhaps even relaxed, whereas New York time hurtles forward, sweeping you along with it. While I still love that rush, I suppose there’s a part of me that has also become decidedly Californian. I like having the luxury of marveling at the sky on an empty street corner as much as I do the ready supply of fresh produce at the market twelve months a year. In a nutshell, I guess I’ve become spoiled. I had planned to write about this tart back in early February, which is when I made it, but a cold, a Greek class and a trip to Tahoe all got in the way. However, it now seems fitting that this post should follow my trip to New York since this Smoked Salmon Creme Fraiche Tart with a Cornmeal Millet Crust from Megan Gordon’s Whole Grain Mornings is essentially the Californian version of the classic bagel with lox, cream cheese and capers. And I have to say that it’s more than a fine replacement for a meal that I’ve never felt quite comfortable replicating in the Bay Area (it is said that we now have bagels that rival, maybe even trump, those in New York, but I’ve never had an occasion to find out if this is rumor or truth). The tart dough alone is wonderfully crunchy (I’ve fantasized about turning it into crackers, but the dough is a bit wobbly for that; the recipe, which doesn’t call for any all-purpose flour, would have to be revamped) and the salmon, dill, creme fraiche make for a fresh and clean-tasting breakfast. It’s wholesome enough to crave on a daily basis (it is, however, perhaps too much work for that), but fancy enough that, should you be hosting a breakfast or brunch, it should certainly grace your table. The recipe comes from the spring section of Gordon’s slim, but inspiring book and I’ll confess that, although the Bay Area has been having its fair share of gorgeous weather since early January, it still seems odd that most of the recipes I’ve made from this book are from the spring section. That being said, no matter what the season they’ve all been flavorful and filling–from the dark chocolate hazelnut spread to the California Barley Bowl–the kind of food that you want to eat for either breakfast or dinner. The Smoked Salmon Tart was one of the reasons I bought the book (that and the fact that I read Megan’s blog fairly religiously; also, the chart that breaks down quick-cooking and slow-cooking whole grains is a godsend for any modern kitchen); the recipe incorporated several ingredients that I love and also seemed Scandinavian to me, which is why I felt compelled to add a teaspoon of Dijon mustard (the flavors reminded me of this pasta). You can hold the mustard or not, but do find a way to incorporate this into your breakfast repertoire; it really offers a refreshing spin on a classic. Megan calls for a 9-inch tart pan and, because mine is fluted, I opted to use a 9-inch springform pan instead. Since I always worry about things sticking to the pan, I also decided to flour it, using whole wheat flour. Another alternative is to line the bottom of the pan with parchment. I should say that I didn’t have too much trouble removing the tart from the pan when it was still warm, but as it cooled it was harder to remove and started to break. As I said earlier in the post, I was compelled to add a teaspoon of whole grain Dijon mustard to the filling and I liked the results, but this addition might not be for everybody. 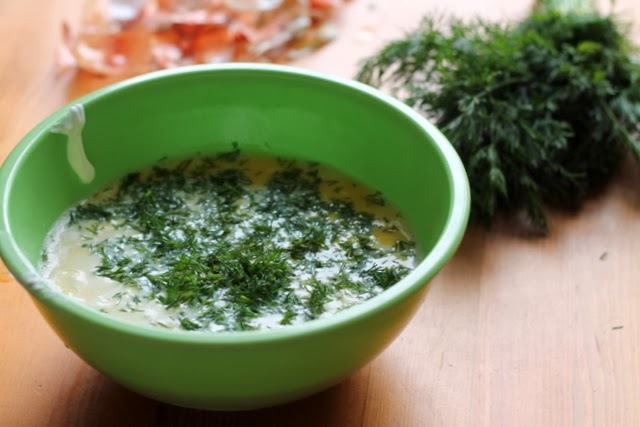 As far as ingredients go, I have the feeling this is a fairly forgiving recipe: you could substitute chives or parsley for the dill, you could hold the capers and you could substitute leeks or yellow or red onions for the shallots. Also, if you don’t have creme fraiche, Megan suggests using sour cream, but I imagine that even softened or whipped cream cheese would do the trick as well. -Butter a 9-inch tart pan with a removable bottom or a 9-inch springform pan. -Using a food processor fitted with a metal blade, pulse together the cornmeal, flour and salt. -Add the butter and pulse into the mixture resembles coarse meal. -Add ice water 1 tablespoon at a time and pulse until the dough starts to resemble wet sand. You will know it’s ready when a small piece holds together when squeezed between your fingers. If it’s still crumbly, add more water, one teaspoon at a time. -Scrape the dough into a large bowl and, using a fork, mix in the millet. -Press the dough into the tart or springform pan evenly, going one inch up the sides. -Cover and chill in the refrigerator for at least 1 hour. It can also be made a day in advance. -When ready to bake the dough, preheat the oven to 375 F.
-Blind bake the crust for 15 minutes and then remove from the oven and set on a rack to cool. -As the crust is cooling, prepare the filling. -Heat the oil in a small skillet and saute the shallots until translucent (2-3 minutes). Then, add the garlic and saute for another minute. Remove from heat. -In a bowl, whisk together the milk, creme fraiche, beaten eggs, capers, dill, mustard (if using), salt and pepper to make a custard. 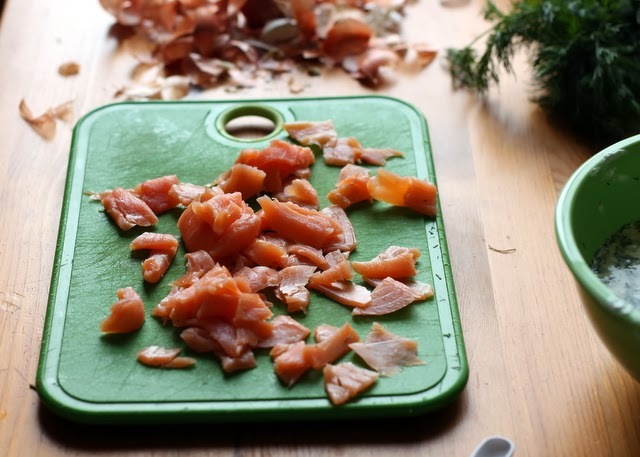 -Spoon the shallot mixture in an even layer on the bottom of the crust and evenly arrange the salmon across the top. Pour the custard mixture over the salmon, shallots and garlic. -Bake at 375 F until the top of the tart is golden and the filling is set, about 30-35 minutes. -Remove the tart from the oven and let cool for at least 15-20 minutes. -Unmold the tart or cut in the pan. Serve warm or at room temperature. The tart can be stored for 3-4 days. I'm planning on making this next time we have friends over on a lazy, late weekend morning — it looks like the perfect savory element to a good brunch spread! I know what you mean about February zipping by (and now I'm starting to feel that way about March!). It's very sweet to hear that you sealed the circle of academia back at Columbia, and especially that you were happy to come home to Berkeley. I'm so glad to hear that this will be making an appearance on your table; it really is wonderfully tasty, as well as pretty to look at it. Ever since I got Gordon's book, I've been wanting to have a brunch gathering, but there just hasn't been time…Things will settle down eventually–at least this is my hope! Thanks, Ann! The millet crust is definitely part of what makes this tart special; it's a very pretty crust, studded with the little millet seeds (some fell on the floor and the dog loved it, which is not necessarily a glowing review since she'll eat pretty much anything, but still a millet-eating dog is pretty unique!). And I highly recommend Pisticci; it's tucked away in a little corner on LaSalle, but that's part of its charm…I look forward to your report! How beautiful! I was so excited that you got to make that last New York trip, and glad that the circle has come to a close. It's amazingly inspiring to me how much peace you have about it! I feel like it's taken me much longer to get there–I blame dissertation trauma! In any case, hurray for breakfast and for the California pace of life. I just bought a handful of passion fruits at the farmer's market last week and am feeling decidedly spoiled myself! Well, I think we all have our fair share of trauma in graduate school, but maybe the thing is that I started to disconnect from it a long time ago and this just felt like the end…Or maybe there's something in my character that allows me to part ways with things and not to look back (a blessing and a curse perhaps)? Whatever it is, it made me see the conference through de-Slavicized eyes and those eyes were not in the least nostalgic.